Being a mother I like to be able to stay in touch with my older children who have flown the nest, so instead of having a landline phone like we do they have upgraded to iPhone 6. At least I know I can usually get a hold of them where ever they may be. My daughter's birthday is right around the corner and she asked me to get her some cases for her phone, so being the blogger and money saver I am I have been signing up to try some out and let my readers know how they are. 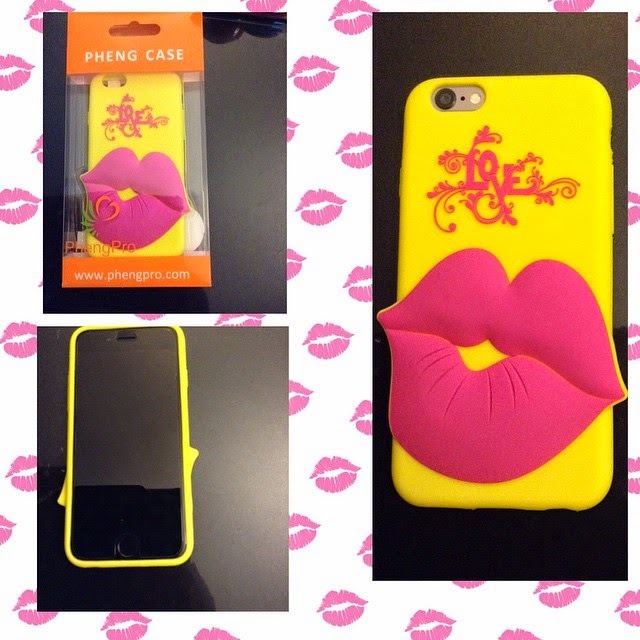 This Kiss phone from Phengpro is a fun phone case and something I wouldn't mind having if I had a phone to fit this. Hint I have a LG Optimus Showtime (which was lost in a hamper for a few months, later on that in another post). This case fits her phone perfectly and she is in love with it. The colors are vibrant and stand out. Very nice for girls, teens, and women. What PhengPro has to say about their product. A Must Have iPhone 6 Case for Girls! Phengpro Silicone Case For Women or Girls with 3d Fashion Lip Design -Protects Your Apple iPhone from Scratches and Other Daily Wear Damages! – These new high quality cool trendy protective cases for girls are very stylish & attractive with a cool 3D effect. It definitely will match your unique style. Compatible with iPhone 6 (4.7) & Perfectly Fit Your iPhone 6 (4.7Inch), Full Access to All Buttons, Controls and Ports with Excellent Protection– It is easy to install or remove and allows you to access to the function buttons of your phone easily and quickly without worries. It is scratch-resistant protecting your iphone from dust, slips, etc. New, Top Quality, Eco-friendly, 100% Food Grade Silicone Cases, Slim, Perfect Fit, Light, Non Slip, Shock Absorbent, Anti-static With Soft, Durable, Flexible Texture! – It's made of 100% food grade silicone material with no side effects to human body-non-toxic. It’s also slim, light & comfortable to the touch and heat and cold-resistant. Various Colors Available (Yellow, Blue and Clear/White) –There are 3 non-fade vibrant colors (blue, yellow, white/clear) readily available for you to choose to meet your personal style.